The modern digital world of convenience and instant conveyance has one slight flaw. Anybody who utilizes ostensibly free services like Google's search, Google Chrome, YouTube, Picasa or Google Earth pays with a small piece of themselves. This is done through the collection and utilization of user profiles and user cookies. They store information of various kinds, allowing Google to produce perfectly tailored advertisements and search results. 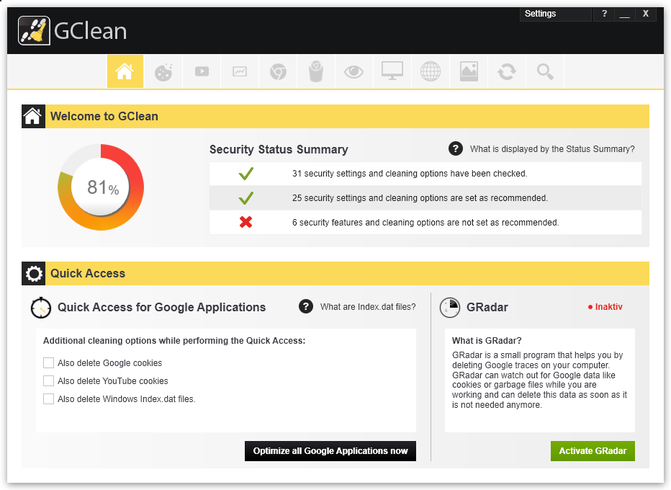 GClean detects services like Google Search, Google Mail, Google Maps, YouTube, Chrome, Google Analytics, Google Toolbar, Google Desktop Search, Google Earth, Google Updater and Google Picasa. In particular, for Google Chrome, it's possible to delete the browsing history, clear the download list, remove all cookies, clear the cache, clear saved form data, and forget saved passwords. The G-Radar feature prevents future information collection attempts, and sounds an alarm when a Google service tries to save a new cookie. If you ever wondered how to avoid Google to collect your data, this issue is also solved by GClean. Besides all features that block data traffic, the software also includes an information removal request. GClean supports the latest browser and Google service versions, ensuring optimal performance thereon. Additionally, the application has received a completely new interface; it is more modern, more simple to understand, and more intuitive to use. Urine, what a deluded paranoid illegal down-loader. Probably perverted material. Parasite program piggybacking on the ignorance of people. Save you'r 14$ by either using free Chrome extensions to block ads and other unwanted sites if you like, or switch to Opera, FF, etc. @Uriel: I'm glad you figure it out by now that I know what I'm talking about when I've reviewing a program. Just for the record: I'm not I'm not involved in Google Chrome development in any way - how abut moving your "investigation" a bit further a making it accurate this time, the info is freely available. What I'm doing in my private life however is not a secret at all, as you already read in my reviews so far, know that I'm actively reporting issues for any programs I'm using, if there is simple way of doing that (Chrome->Tools->Report and Issue, or Opera->Help->Report a site problem or Firefox->Help->Submit Feedback). I have a life after all and a family to attend. I believe a good feedback is always welcome rather that babbling around without any constructive opinion. I simply don't understand you... you turned this Google phobia of yours to new levels. Have no issue with the GoogleClean you're defending so fearsomely, I know they did a good job, unfortunately there is something wrong with charging money for patching an free/open source program. Like I've said, there are free solutions for that, if you know your tools. Works unobtrusively in the background keeping the Google marketers at bay. Those who value their privacy will really appreciate what it does. The best thing of all, it monitors "ALL" of Google's spyware apps. So an extension in Chrome is not going to help much if you also use Google Earth along with super cookies for example. I understand you are a Project Manager at MIND CTI who is involved with the development of Chrome even if reporting a bug? If so, I can understand your position.